The United States’ Sixth Fleet’s command and control ship USS Mount Whitney visited the Bulgarian Black Sea port of Bourgas from October 20 to 22 while conducting naval operations in the Sixth Fleet’s area of operations to engage with key allies and partners in the region, the US Navy and Washington’s embassy in Sofia said. 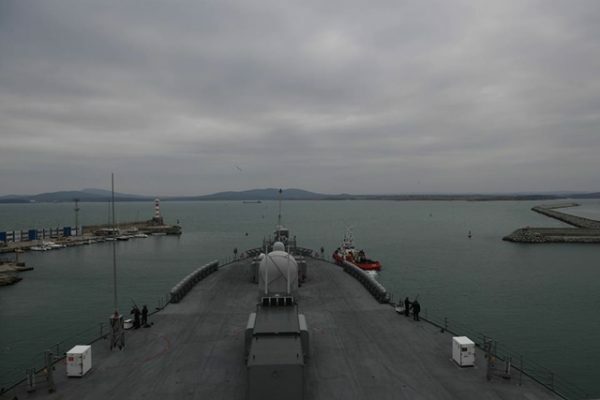 Under the command of Captain Carlos Sardiello, USS Mount Whitney arrived in Bourgas, Bulgaria, on October 20. During the visit to Burgas, the US Naval Forces Europe Band, which travels with Mount Whitney, held a concert at the Bourgas Music and Stage Arts School. This was a chance for the band and school to renew old friendships, since in 2014 the band performed for students from the school on board the ship, the US embassy said. This time the band visited the school, and the students enjoyed a rousing performance of traditional American music by both the jazz band and New Orleans brass band. “The students then offered a warm welcome to the American musicians with a performance of the school’s brass band,” the embassy said. After the concert, the US Navy band musicians held a master class with the school students.